The Aluminium Chairs EA 101, EA 103 and EA 104 by Charles and Ray Eames are ideal for using in combination with tables: in comparison to the other models in the Aluminium Group, they are somewhat lighter, narrower and higher. Thanks to the wide selection of subdued or bright upholstery colours, it is easy to find the perfect chair for any dining room interior. 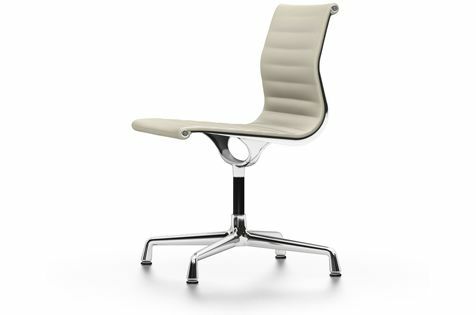 The three models differ in the type of base – fixed or swivel – and whether they come with armrests. Chair with medium-high backrest; table-oriented sitting position. Seat in mesh fabric or upholstered with high-frequency welded horizontal ribbing in Hopsak, Leather or Premium Leather. Side profiles and spreaders in polished or chrome-plated die-cast aluminium. Four-star base in polished or chrome-plated die-cast aluminium.